Home MTAANI NEWS WA JUNGLE: They have ganged up to ‘stone’ me because am fruitful. WA JUNGLE: They have ganged up to ‘stone’ me because am fruitful. Eng. 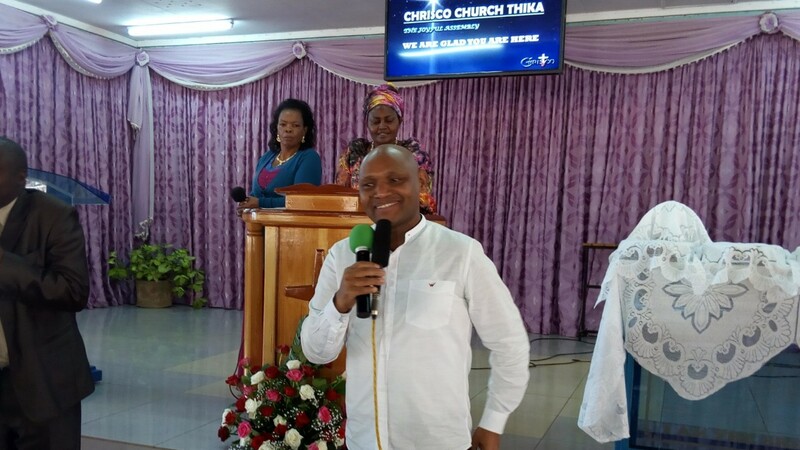 Patrick Wainaina Wa Jungle addressing worshipers at Chrisco Church Thika where he asked Thika residents to ignore all kinds of rumours peddled against him by his competitors on Sunday. He visited several churches where he also called for peaceful elections and appealed for their votes come August 8. Eng. Patrick Wainaina Wa Jungle has condemned what he called a gang up by politicians against him due to his rising popularity in Thika Town Constituency that has rubbed them the wrong way. Speaking in various churches on Sunday, the engineer said that, for months now, a section of Kiambu County Jubilee Party leaders had launched a massive negative campaign against him, with the hope of denting his developmental record and instilling fear among the people. He described the ongoing smear campaign launched against him as deliberate misinformation, designed to mislead the gullible public and set the people against him during the August 8 election. “It is only at the tree loaded with fruit that lads throw stones. When you see all these politicians come to Thika to throw stones at me, it is because I am a good tree full of fruits. They have seen a lot of harvest in me and I won’t go down to their level by throwing the stones back to them. I will simply throw them these fruits so the seeds of our good work may inspire them to change their ways,” said Wainaina. He pointed out that being voted in as an Independent Member of Parliament did not necessarily mean that one was in the opposition nor were they any different from the other MPs nominated by parties. He added that the current parliament had four independent MPs, with three among them; Wesley Korir (Cherangany), Gatobu Kinoti (Buuri) and John Serut (Mt. Elgon) who always voted with the Jubilee government in Parliament. He reminded Thika residents that it was virtually impossible for one to both peddle propaganda and initiate development projects as the two would never go together. Wainaina reckoned that propagating falsehoods against independent candidates was detrimental to the development of this constituency and the country at large as this would only expose the people to a leadership that only cared about themselves. “My mind is fully focused on my agenda to improve the lives of our people. I have left propaganda to those who have nothing to offer. And let me warn you that between now and election day, they will create all sorts of propaganda and smear campaign against me but I know Thika residents are wise to differentiate between facts and falsehoods,” he said. Wainaina lamented that none of these politicians really cared about youth unemployment in the region because they benefitted most from the desperate young people for political expediency. He said that instead of doing something about this dilemma, these leaders had designed a scheme to exacerbate it, relying on young voters to continue their apathetic ways. “Where have they been all that time when you the youth suffered from joblessness? The importance of providing young people with employment pathways cannot be underestimated. Without the right support you are going to cycle in and out of mental health services and prison systems,” he explained. Jodan college student stab colleague to death. This is why Thika people should be very worried.